A bitter gastric stimulant, Gentian promotes the production of saliva, gastric juices and bile. Also accelerates the emptying of the stomach. It increases gastric secretion and has been used for centuries as a digestive tonic both in alkaline and acid conditions. 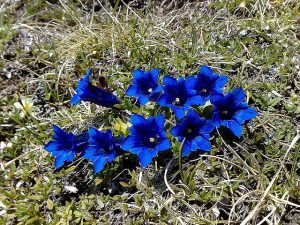 Gentian relieves stomach dyspepsia and flatulence and is useful in cases of gallbladder dysfunction and liver problems. It also increases the absorption of nutrients across the gut wall including Iron and Vitamin B12. Therefore it is recommended for iron deficiency problems associated with blood loss. Gentian is often added to herbal prescriptions for women with heavy menstrual bleeding. Active Constituents: Bitter glycosides (amarogentin, gentiopricrin, sweitiamarin), alkaloids (including gentianine and getialutine), xanthones (including gentisein and gentisin), triterpenes, sugars, volatile oil. Also flavanoids, tannins and mucilage. Contraindications: Should be avoided in cases of acute gastritis, stomach ulcer and haemorrhages in the gastro-intestinal tract. Should not be used by people suffering from an excessive number of red blood cells as the plant can exacerbate the conditions. Not advisable during breast feeding because the breast milk can become very bitter. Excessive use of gentian should be avoided with high blood pressure due to the plant having a hypertensive effect.